To electronically file a document onto an existing case, you must first find the case. From our court cases tab. Go to your list of My Saved Cases if you have previously saved the case. 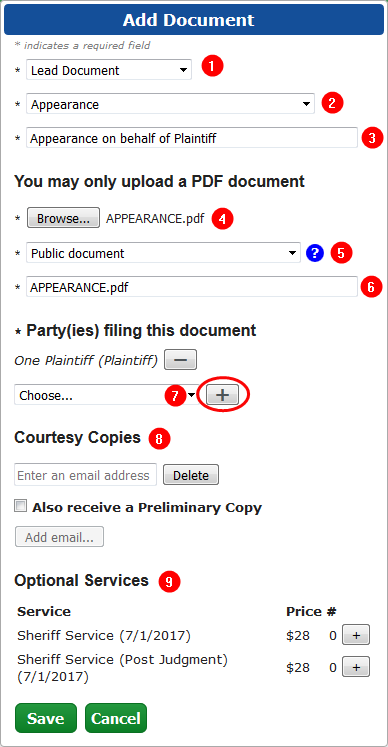 You can use the "Find By Case Number / Confidential Case Search" feature on the e-filing tab. This tool requires that you enter the exact case number (including hyphens), but does not use up one of your subscription searches. You should use this tool to find Confidential, Appellate, or Tax type cases that aren't available through the standard Doxpop Search. Please keep in mind to enter the case number (including hyphens) exactly as the Clerk has entered it into their case management system. Protective Order (PO) type cases are not available for e-filing. Please continue to use conventional methods for filing into these cases. 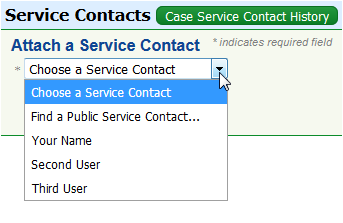 When filing into a case you will want to add yourself as a service contact. * This allows opposing counsel to serve you electronically for any of their subsequent filings. When added there will be a button and a button. 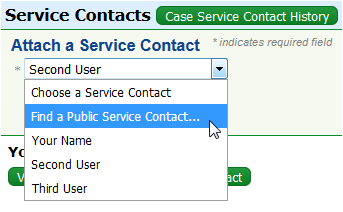 * If you mistakenly add a service contact (even a public service contact) you can detach the contact simply enough by clicking the button provided. * The information provided is your email address and phone number (if provided). You can associate the service contact with a party on the case but it is not required. 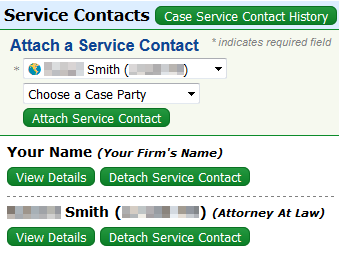 If opposing counsel is not listed in the Service Contacts section, you can search for and add them to the case. 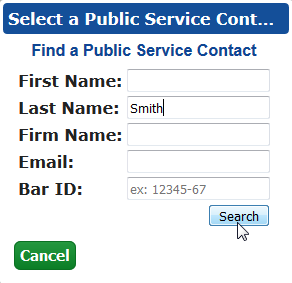 To add a contact that is not within your firm, just click the drop down menu in the Service Contacts box, select "Find a Public Service Contact..."
Try searching by Name, Firm Name, Email Address, or Bar ID. The name and bar number of the attorney will be presented with a next to them. You are attaching the attorney's public service contact to this case. Click the button associated with the name. Once attached, they will also have a button and a button. * If you make a mistake and add the wrong contact, you are able to detach the public service contact since you were the one that added them. * Associating the contact with a party is optional. 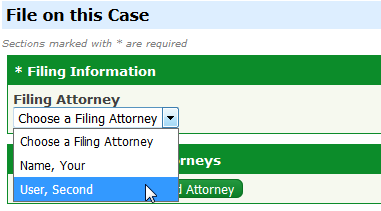 When submitting a filing as (or on behalf of) an Attorney, verify the correct name is presented from the drop down menu. To add a new party, just click the button. Roll of the new party to this case. 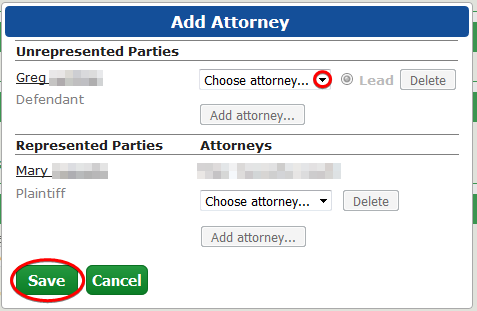 * If an attorney is adding a new party they represent, the attorney can select their name from the drop down menu at the bottom of the form before saving. ** If an attorney is only filing an appearance, please see item 6. "Filing An Apperance" to the left. 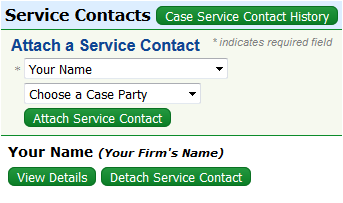 When saved, the "New Case Parties/Attorneys" section will present what you have entered. * Here we have added an interested party and a garnishee defendant for an example. If you are filing an appearance on a case, be sure to add the Attorney to the case and associate them with their party. 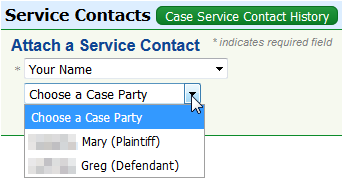 Select the Attorney's name from the drop down list that corresponds with the party. Find and click the button. By unchecking the box associated with a contact, you will omit service to that contact. * Continue to click the "Add Document" button for all the documents you need to file on the case. The first document will always start out as a "Lead Document". All documents should be filed as a lead document separately. Exhibits should be filed as an attachment to a lead document. 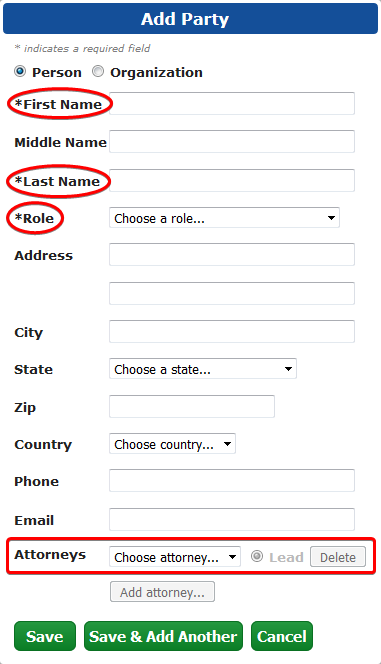 If the list of filing types does not have what you need listed, select "Petition". -This will be presented in a minute entry. Next, find your PDF document on your computer to attach to this filing. Select this document's security from the drop down menu. The description of your document will default to the name of your PDF file. -You can enter your own text in this field. Select the party you are filing on behalf of from the drop down menu. Be sure to click the [+] (Add) button to show the association. Courtesy Copies are optional, but you can add an email to send a copy of your filing on this form. If service by Sheriff is required, click the [+] button next to the appropriate selection. * This fee will be charged to the credit card attached to your e-filing account. Continue to click the button to add more documents as needed. But, please keep in mind the total size of your filing can not go above 35MB. Select the party the attorney represents from the drop down menu under "Party Responsible for Fees". Select the credit card attached to your e-filing account from the drop down menu. Read through each item next to the check boxes and check them off for acknowledgement. Once the 3rd step has been completed, the system will calculate any fees due (if applicable). The button will become active to submit your filing to the Clerk for review. The button will become active.